Miscellaneous Literary, Scientific, and Historical Notes, Queries, and Answers, for Teachers, Pupils, Practical and Professional Men. A Monthly History, Folk-Lore, Mathematics, Literature, Science, Art, Arcane Societies, etc. Norfolk, VA, then Manchester, NH. Publisher: S.C. Gould and L.M. Gould. Editor: N.B. Webster, July 1882-June 1883; Sylvester Clark Gould, July 1883-June 1902, with G.W. Browne, January 1899-August 1900, and with L.M. Gould; S.C. Gould again until 1909. Miscellaneous Literary, Scientific, and Historical Notes, Queries, etc., 1882-89. Bizarre Notes and Queries, 1886-91. Miscellaneous Notes and Queries: A Monthly Magazine of History, Folk-Lore, Mathematics, Mysticism, Art, Science, etc., 1892-97. Grand Man Notes and Queries, 1898. 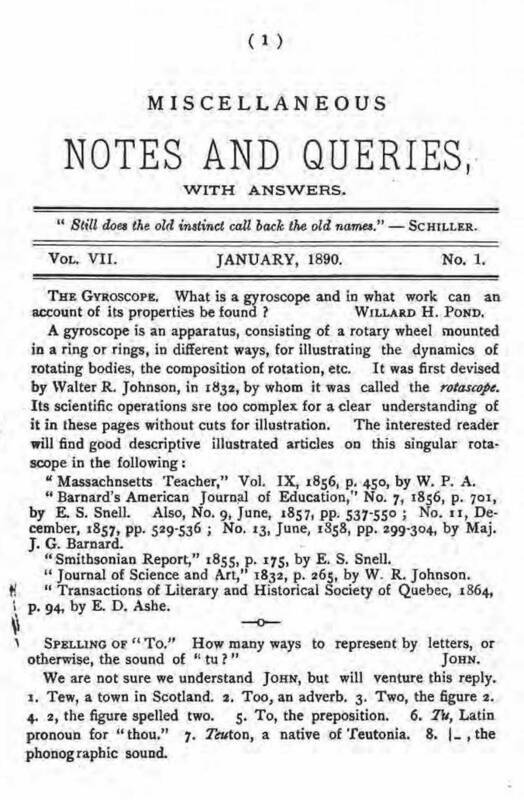 Notes and Queries and Historic Magazine, 1899-1902. Historic Magazine and Notes and Queries, 1902-1909. The subtitle given above is from this. In addition to learned correspondence on mathematics, phonetic spelling, obscure etymologies and the usual minutiae of antiquarianism, Notes and Queries reprinted P.B. Randolph's curious The Riddle of Hermes (1870), a broadside riddle for the solution of which Randolph offered-with complete safety-$5,000, and gave parts of F. Leigh Gardner's, A.L. Cahagnet's and Robert H. Fryar's works on magic mirrors. The learned comments of Alexander Wilder-the editor of H.P. Blavatsky's Isis Unveiled and the editor of the Journal of American Akademe-were also frequently featured, as were articels by W. Wynn Westcott (on the Isaic Tablet) and John Yarker ("The Order of Ishmael or B'nai Ismael" and "The Society of the Rosy Cross," in which Yarker affirmed the possibility of drawing down a guardian spirit to possess another's body). Gould also exchanged advertising space with (or sold space to) T.M. Johnson's The Platonist, W.P. Phelon and his wife's The Hermetist, Ezra Heywood's The Word, The Theosophist, The Occult Magazine (of Glasgow and Georgia), Robert H. Fryar's phallic "Bath Occult Reprint" series (which was featured regularly for decades), Hiram E. Butler's Solar Biology, John Yarker's The Kneph, and the Reverend George Chainey's and Anna Kimball's The Gnostic (San Francisco), which carried the articles of Freeman B. Dowd in the late 1880s. In addition to this, Gould published his own astonishing list of Arcane Societies in the United States (both in this journal and collected in pamphlets issued by the Societas Rosicruciana): hundreds of small groups, many with their own journals, practicing fraternalism or promising occult secrets. Gould's opinion of many of these (and his sense of humor) is evident from the epigram he placed on the compilation: "Master, is all of this necessary to gain a knowledge of God?"-Saint-Martin. Despite this, Gould seems to have been a member of many of these societies: the H.B. of L.; the Hermetic Brotherhood of Light, the Martinist Order and Union Idealiste Universelle of Papus (Gérard Encausse), Margaret Peeke, and Edouard Blitz; the Societas Rosicruciana in Civitatibus Foederatis (the Masonic offshoot of the S.R. in Anglia and in Scotia); the S.R. in America (of which he was one of the principal initiators); the Theosophical Society (which he joined in Rochester, New York, in 1885, under Josephine Cables); the Odd Fellows; Max Theon's Mouvement Cosmique; the Temple of the Rosy Cross led by Edward Holmes Brown ("Eulis"), etc., etc. Gould's compilation of secret societies found its way also into La France Antimaçonnique (q.v.). Beyond all of this joining of groups, Gould claimed to have received a mysterious Rosicrucian initiation in his youth: ""Suffice it to say we became one [a Rosicrucian] in the '50's, the theosophical sum of which year is 16 . . . ." That can only be 1852-when Gould was 12 years old. Notes and Queeries 26/9 (September 1908):177-178. At the end of his life, Gould began to publish the quarterly The Rosicrucian Brotherhood which was more explicitly devoted to his esoteric interests and was obviously intended to as propaganda for the Societas Rosicruciana in America that Gould and G. Winslow Plummer ("Khei") were in the process of forming. The catalogue of Gould's papers in the Manchester (New Hampshire) Historical Association, says that Gould was a printer and then railroad depot manager before becoming a publisher, and notes that the final issue of this journal was set up ready to print before Gould was taken to the hospital with his last illness-in other words, he printed the journal himself. The "L.M. Gould" whose name appears on the journal was Sylvester's younger brother, Leroy M. Gould, who died in a boating accident in 1902. New York Historical Society; Manchester Historical Association; University of Chicago.